“We need constantly to contemplate the mystery of mercy. It is a wellspring of joy, serenity, and peace. Our salvation depends on it. Mercy: the word reveals the very mystery of the Most Holy Trinity. Mercy: the ultimate and supreme act by which God comes to meet us. Mercy: the fundamental law that dwells in the heart of every person who looks sincerely into the eyes of his brothers and sisters on the path of life. Mercy: the bridge that connects God and man, opening our hearts to a hope of being loved forever despite our sinfulness. The logo and the motto together provide a suitable summary of what the Jubilee Year is celebrating. The motto Merciful Like the Father (taken from the Gospel of Luke, 6:36) invites us to follow the merciful example of the Father who asks us not to judge or condemn but to forgive and to give love and forgiveness without measure ( Lk 6:37-38). The logo – designed by Father Marko Rupnik SJ – presents a small theological summary of the theme of mercy. In fact, it shows an image quite important to the early Church: that of the Son having taken upon his shoulders the lost soul showing that it is the love of Christ that brings to completion the mystery of his incarnation ending in our redemption. The logo has been designed in such a way so as to show the deep way in which the Good Shepherd touches the flesh of all people and does so with a love with the power to change one’s life. One particular feature is that while the Good Shepherd, in his great mercy, takes humanity upon himself, his eyes are merged with those of man he carries. Christ sees with the eyes of Adam, and Adam with the eyes of Christ. Every person discovers in Christ, the new Adam, one’s own humanity and the future that lies ahead, meditating, in his gaze, the love of the Father. The scene is expressed within the mandorla (the shape of an almond), a shape quite important in early and medieval iconography, for it calls to mind the two natures of Christ, divine and human. The three concentric ovals, with colors progressively lighter as we move outward, suggest the movement of Christ who carries humanity out of the night of sin and death. The depth of the darker colour suggests the never changing love of the Father who forgives all. POPE FRANCIS EXPLAINS YEAR OF MERCY ! Sadly I understand this event has now been cancelled because the numbers were too low to continue for this year. 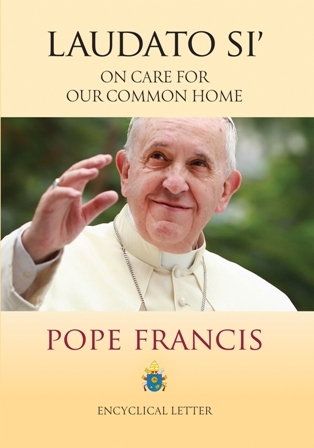 I was so thrilled to get my personal copy of this wonderful encyclical ” Laudato Si ” by Pope Francis. Every paragraph nourishes the soul and sets challenges for us. Below I have attached a pdf of the full text so you can download it to read for yourself. I suggest there is much in it that senior Students would find of great interest and challenge. I will attach further materials as I find them. The Irish Episcopal Conference produced and excellent pastoral letter “The Cry of the Earth” with an excellent resource for prayer and worship entitled ” Glas” ( Irish for Green !) containing assemblies and projects to work on. In order to raise awareness and understanding of what Climate Justice is and to encourage action to achieve it the SMA has initiated this Campaign which is being used at all SMA events and in all SMA Houses during 2015. It asks individuals to promise or pledge to be better stewards of God’s creation. People are asked to promise to take greater care of their own environment where they work or live and to use energy, food and other everyday materials more carefully. Putting a thumbprint on a Pledge Sheet and reciting the Pledge (see below) is the formal act or sign of this commitment and all who do so also put their thumbprint on a Card which they keep as a reminder of the promise they have made. The Card has the pledge text on one side and practical suggestions on simple actions to care for the environment on the other side. Lord God, I pledge to take greater care of my environment, to do what I can in my own home and place. I promise to use your gifts wisely and carefully, mindful that what I do today is affecting our world, the lives of others far away and generations yet to be born. I place my thumbprint here as a sign of this pledge and I ask you for the strength to put it into action in my life and in the example that I give to others. prayer-ls Pope Francis’ prayer from Laudato Si. prayer_service Could be used after viewing the video. Please find attached a poster from the SMA Justice Office inviting you to participate in the International Day of Prayer for Climate Justice which takes place on Sunday 1 November. Please join with the SMA family in this intention and circulate this to anyone with an interest in this critical issue for the global community at this time. Almost every page of the Bible speaks of God’s heart for the poor, concern for the marginalized, compassion for the oppressed, and God’s call for justice. This unique bible visually highlights more than 2,000 passages that speak of poverty and injustice. This is an excellent Bible for everyone who wants to take Pope Francis’ challenge to reach out to the poor seriously, and especially social justice groups, youth, and young adults. Challenging the notion that the Bible is a dusty, outdated rulebook, it shows that, on the biggest issues of our day, the Bible got there first. Arch Bishop Eamon at Knock recently said …. Students might be encouraged to read some of the published reactions and reflections that have come since the Holy Father published his document. The Tablet in England had a whole series for weeks where people were invited to respond. Makes exciting and challenging Reading. glas-resource Brill book for reflections, Assemblies and prayer.